In Chapter 20 of The Intelligent Investor, Benjamin Graham covers the ” ‘Margin of Safety' as the Central Concept of Investment.” This big idea or motto is the “secret of sound investment” distilled to three words. This article covers the book's last chapter and continues from a review of Chapter 19 on whether dividends are important to investors by Joseph Hogue, CFA. For an overview of the book and links to all chapter reviews, check out Understanding The Intelligent Investor. 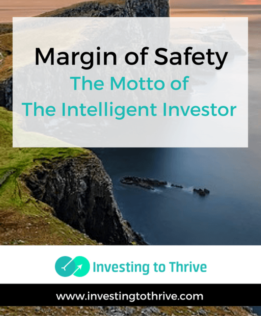 As I delve into this chapter, I learn that though the margin-of-safety principle is one of the main things, it's not the only thing relevant to intelligent investing. Its companion is diversification. In addition, I discover that real-life adherence to safety margins isn't simple or always achievable. Household A decides to buy a home and get a mortgage that comprises 40% of its current income. The family believes that the mortgage obligation will become easier to manage when its credit card balances are paid down and car loan is paid off. In addition, when each earner gets an annual salary increase, the percentage of the mortgage debt compared to income will fall to more manageable levels. Household B also decides to buy a home but gets a mortgage that comprises 25% of its current income. The family has plenty of money available to pursue other goals, such as paying off other debt, saving for college, and saving for retirement. In addition, even if one earner loses his or her job, the household can still service the debt or sell household items to pay off the mortgage. Household A is relying on future developments to improve its financial position. Household B can save and upgrade its financial status regardless of future pay raises or payoffs. In addition, if hardship happens, Household B has a greater cushion than Household A. Household B has a greater margin of safety than Household B. Similar to households, companies that regularly earn much more than their debt payments and/or own tangible assets that greatly exceed their debt obligations carry relatively high margins of safety. A railroad that consistently earns more than five times its interest charges over a period of many years has a nice safety margin. The desired multiples of earnings over interest may depend on the industry. The wherewithal to make timely interest payments — even if earnings fall dramatically — is a safety indicator. A company with outstanding bonds or debt of $10 million that is “fairly worth” $30 million has a good safety margin. Bondholders should get their principal back even if the company's value declines significantly or needs to liquidate to meet obligations. Graham says margins of safety could be determined in a similar way for preferred stock. Determining the margin of safety with common stocks seems more complex compared to bonds — which generally pay a specific interest or coupon rate along with a principal repayment. Stocks have the opportunity for significant price appreciation or loss in addition to yielding dividends (if the company pays dividends). When a stock's earning power (Earnings Per Share divided by Price Per Share or 1 divided by P/E Ratio) exceeds the interest rate of the bonds issued by the same company, then a margin of safety exists. The more the earning power exceeds the interest rate, the higher the safety margin. For example, a company in which I own stock reported Earnings Per Share of $2.73. Its stock price is about $74, meaning its earning power is about 3.7% ($2.73 / $74 = 3.7%). Its bonds pay 3.7%. In this situation, the margin of safety is nonexistent. Further, there may be no reason to take the extra risk associated with stock purchase (and potential decline in price) if the returns on the bonds and stock are the same. When stocks sell for a price equal to the value of the underlying company's property (its real estate, facilities, etc.) and its earning power, the margin of safety is relatively high. Graham says that in these conditions, stocks “supply an ideal, though infrequent, combination of safety and profit opportunity.” Generally, such circumstances exist only during an economic depression. Applying margin of safety in the real world of investing is tricky. That's because if I wait until I find the ideal circumstances, then I may sit on the investing sidelines for a long time. Finally Graham says that a safety margin is best applied to “undervalued or bargain securities” of decent companies. Basically, an undervalued stock is one with a safety margin. If I buy at a bargain price, then I'm less likely to be disappointed as a moderate decline in earning power may not cause an investment loss. I've applied the margin of safety idea to evaluating growth companies, which generally have overly optimistic expectations baked into their prices. The safety principle has helped me to projected muted growth (compared to market excitement) and identify the price at which a growth stock could be undervalued. Price drops occasionally happen for a day or two during a market fallout from Brexit or some economic fear. I won't say that my approach is perfect but has helped me either avoid losses or understand why I incurred losses after ignoring the safety mechanism. Graham concludes his discussion of the margin of safety with the idea that diversification is a desirable companion in making investment decisions and building an investment portfolio that's “successful.” A successful portfolio generates profits and not losses. First, he clarifies that requiring a margin of safety doesn't guarantee a specific results. It makes losses more unlikely and profits, more likely. Then, he explains that having it's possible that an investment could go sour, despite diligence in selection. So, by owning a basket of securities rather than one or two hand-picked ones — all with margins of safety — the overall opportunity to gain becomes more likely. The commentary for Chapter 20 focuses on why losses should be avoided, rather than offering insights into specific methods of tackling safety margin calculations. The bottom line: Don't substitute optimism for mathematical calculations. Avoid losses by applying a margin of safety to investment decisions.